Stock market futures for Thursday, Feb. 12, forecasted a 94-point increase from yesterday's close. The Dow Jones recovered from a triple-digit loss Wednesday afternoon to finish down just six points after a choppy trading session. The energy and the utilities sectors weighed on stocks, while investors continue to eye negotiations between Greece and its creditors about the country's perilous debt situation. Today, investors seem prepared to shrug off concerns about Greece and instead focus on retail sales numbers and weekly jobless claims. Investors anticipate a decline in retail sales for the second consecutive month. However, a decline in vehicle and gasoline costs should help buffer the decline. This morning, leaders in Ukraine, Russia, France and Germany agreed to a ceasefire deal to end conflict in Ukraine. 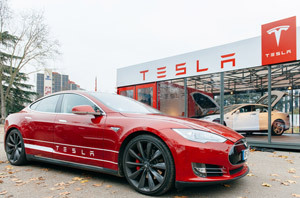 Earnings Week: Shares of electric vehicle manufacturer Tesla Motors Co. (Nasdaq: TSLA) slumped more than 7% after the firm reported weaker-than-expected fourth-quarter earnings after the bell yesterday. The company reported an adjusted loss of $0.13 per share on revenues of $1.1 billion. Wall Street was hoping for per-share earnings of $0.31 on revenue of $1.23 billion. The company increased its sales forecast for 2015, boosting its expected sales figure from 50,000 to 55,000. Merger Mania: Travel site Expedia Inc. (Nasdaq: EXPE) announced plans to buy Orbitz Worldwide Inc. (NYSE: OWW) for $12 a share in cash. Shares of Orbitz soared more than 24% on the news. Keystone Cops: The Republican-controlled House of Representatives passed a bill yesterday to complete construction of the Keystone XL oil pipeline. The lower chamber of Congress approved the Senate version of the bill by a vote of 270 to 152. However, President Obama has said he will veto the bill. The pipeline has been a source of great contention in Washington and a symbol of the nation's political paralysis. And as we noted on Wednesday, a near identical pipeline to Keystone was just approved by the U.S. government, and no one seemed to notice. See for yourself here. Going Viral: Shares of Twitter Inc. (Nasdaq: TWTR) were up more than 1.2% on news that the social media giant has purchased Niche, a startup that brokers deals between brands and digital influencers to create sponsored content. Twitter purchased the two-year-old startup for roughly $45 million to $50 million, according to various reports. Oil Prices Today: Oil prices rebounded this morning on a weakening U.S. dollar and improved expectations on the European economy. Today, March 2015 futures for U.S. crude, priced at the NYMEX in New York City, rose 2.3% to his $49.97 per barrel. Meanwhile, Brent crude, priced in London, jumped 2% to $55.81 per barrel. Volatility in the oil market is now at its highest level since the financial crisis, as February has seen wild price swings in the last two weeks. Earnings Reports: Today, expect earnings results from Zynga Inc. (Nasdaq: ZNGA), World Wrestling Entertainment Inc. (NYSE: WWE), Hospira Inc. (NYSE: HSP), Time Inc. (NYSE: TIME), Sonoco Products Co. (NYSE: SON), Kraft Foods Group Inc. (Nasdaq: KRFT), Kellogg Co. (NYSE: K), Groupon Inc. (Nasdaq: GRPN), CBS Corp. (NYSE: CBS), and Bunge Ltd. (NYSE: BG). Money Morning Tip of the Day: Don't listen to bearish analysts about oil. Prices have already started to stabilize. Citigroup analyst Ed Morse released his most bearish oil price forecast yet on Monday, predicting prices will fall another 60% to $20 a barrel. But what Morse and other analysts like him are getting wrong is oil has already begun to stabilize. You see, the nearly 60% plunge in oil prices resulted in an abnormally oversold market, driven largely by the shorts. Without an actual pronounced decline on the demand side, a price "Armageddon" is unlikely to happen anytime soon. Oil demand continues to climb globally. The International Energy Agency expects demand to hit 1.13 million barrels per day (bpd) in 2016, up from 910,000 bpd in 2015. As for the much harped-on supply glut… U.S. rig count has fallen sharply to decade lows. Operating companies are postponing expensive projects. Doomsayers argue there is still considerable volume available from ongoing existing projects. However, that volume is already factored into a market where demand is not collapsing. Any surpluses are hardly a major factor moving forward. We won't be returning to triple-digit prices anytime soon. But a new medium-term floor in the mid-$50s in New York is likely. And we'll continue to see fantastic profit-making opportunities in the months ahead.